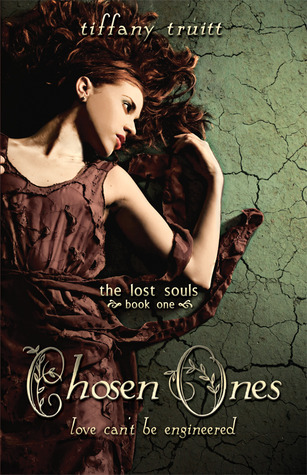 Chosen Ones (The Lost Souls #1) by Tiffany Truitt. Publication : June 12th 2012 by Entangled Publishing, LLC. Tess lives in a dystopian world where most women are barren and having a child means death. Since they're not useful for anything else, women basically played the role of slaves for the 'Chosen Ones' - genetically engineered/man-made boys who are the perfect soldiers. They're better than humans in every way and have no imperfections. According to the counsel, the Chosen Ones were made for the purpose of protecting the naturals from war and any harm, but Tess knows that they can be cruel too. In fact, that's the only thing she knew for sure about them..until she met James, the one boy who sees her for who she is and makes her question everything she ever believed in. I have been dying to read Chosen Ones ever since I saw another blogger's review and I was so happy when I received the ARC! I started reading it without any preconceived notion about the story and I have to say, it definitely exceeded my expectations. Chosen Ones is unique and stays completely cear of the usual, repetitive dystopian story lines and I found it refreshing. The world created in Chosen Ones is interesting and the characters are really memorable. Tess may seem plain on the outside but her qualities make her incredibly strong and I can't help but admire her for that. She is someone who has shunned emotions all her life because they make her weak, so to see her character develop and grow over the course of the book was awesome. I loved that Tiffany Truitt picked James, who's technically a part of the bad guys, as the male lead. The boy gave me butterflies like, all the time. Or maybe it was just Truitt's writing, I'm not sure. James is so, so sweet! As a Chosen One, he was built to be the perfect warrior and yet he questioned his existence. It was gut-wrenching, every time he voiced his insecurities to Tess. Oh, and I have to add - the Frankenstein references were the perfect touch. They helped me understand James better and empathize with him. It's a little hard for me to believe that Chosen Ones is Tiffany Truitt's debut novel because the writing is both amazing and beautiful, all at once. Most debut authors lack the well-formed plot and writing style that Chosen Ones has but Truitt is clearly an exception. If you like dystopian YA novels, believe me, you want to read this. Chosen Ones is wonderfully written, unpredictable and at times, heartbreaking. I loved every minute of it! This book sounds so amazing! The summary is really intriguing, and the book sounds so unique. I'm so glad that you liked it! I love good main characters that grow, and I really like a good male lead too. This book sounds like it's filled with awesomeness. Great review! I'm so excited to read this now! Too bad it's going to be a while until it comes out, though.